A drummer marshes time during a procession with the troops. The drummer is dressed in a red, white and blue uniform. He carries a bugle on his side. The troops arrive for the Rifle and Bayonet demonstration at the Halifax Citadel National Historic Site. 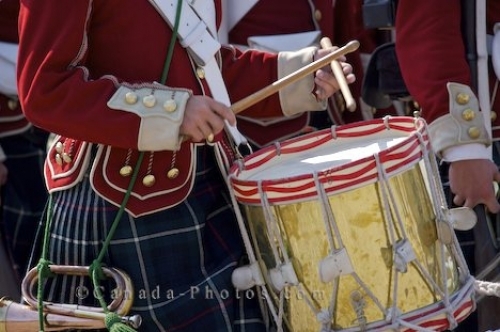 Drummer keeping the marching time for the troops arriving in procession for a Rifle and Bayonet demonstration at the Halifax Citadel National Historic Site, Halifax, Halifax Metro, Nova Scotia, Canada. As the troops arrive in procession, a colorful uniformed drummer keeps time with the marching.